The Tea Smiths are Chad Smith and Grace Landsdale––though the two are engaged, and Grace plans to be a Smith soon, too. In one way, she already is. “We’re tea smiths, instead of blacksmiths,” laughs Smith. “We focus on herbal medicinal teas,” he continues. “We like teas with a purpose.” The Smith’s collection is expansive, and the couple offer a wide variety of green, black, and yerba mate teas, along with their herbal blends. 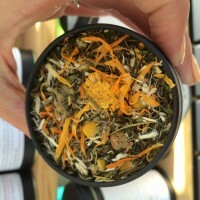 Their most popular tea, however, is one of those “teas with a purpose:” a tea to aid sleep called “sleep blend.” Landsdale points me to another health tea, her favorite, healthy tummy. It’s made to coat the lining of the stomach and consists of peppermint, calendula flowers, marshmallow root, and chamomile flowers. Healthy Tummy tea, with marshmallow root and peppermint. 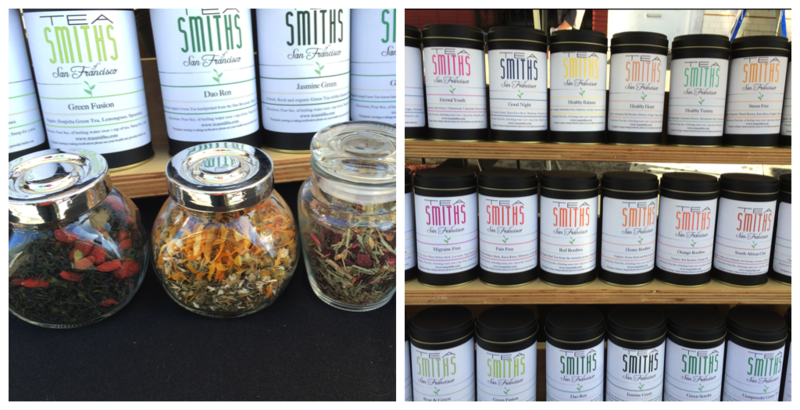 Along with their stock blends, The Tea Smiths offer custom tea blends. Customers can order online, or they can discuss their desired blend with The Smiths at Mission Community Market and pick it up the next week. And if you’ve got kids––don’t worry. The Smiths are in the process of brewing up a child’s line of teas. They’ll be a little bit sweeter and can help out sleeping problems and tummy issues too. All of The Smith’s ingredients are ordered from certified organic distributers, and The Smiths are in the process of getting certified organic themselves. 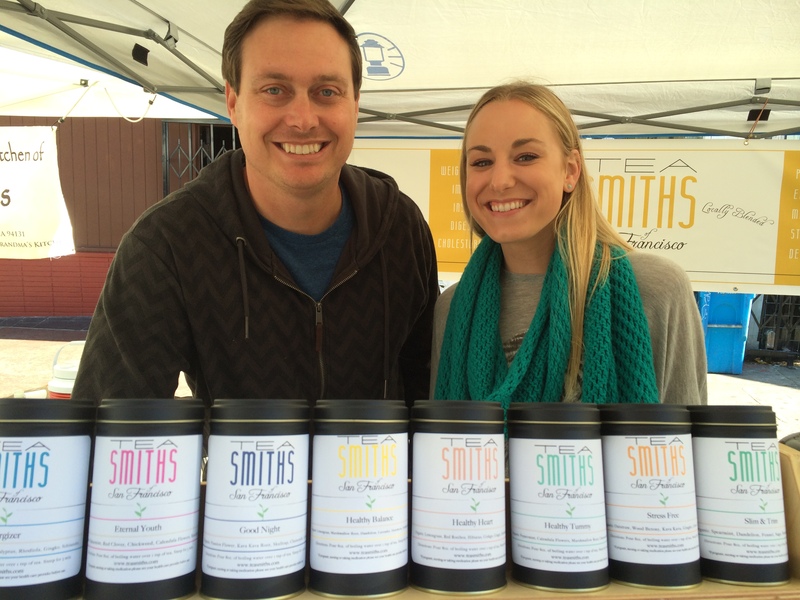 “A lot of people seem to dismiss the importance of organic teas,” says Smith. But for The Smiths, it’s all about the quality and safety of ingredients. In addition to their own tests, they work with master herbalists to create teas that are effective and safe. Some of their ingredients I had never heard of before, like marshmallow roots–used as a throat coat–and kava kava roots. Kava kava has an earthy taste, and is used as a muscle relaxer. In recent years, it’s gotten a bad reputation for liver problems associated with using the entirety of the root, but Smith assures me that if you use water to extract the root, like The Smiths do, it’s safe. The Tea Smiths have a large stock of green, black, yerba mate, and herbal teas. All ingredients are organic. Perhaps one reason why The Smith’s teas are doing so well is that process. The couple is in the middle of a wide rebrand, and before setting any new tea on the table, the two undergo tastings and testings to be sure that every recipe is perfect. One way that The Tea Smiths address customer satisfaction is by speaking to the customers about what they do and don’t like. “If we hear a complaint 3 or 4 times, we start to think that maybe we should change something,” Smith says. On the contrary, if they “get a lot of requests for one herb,” they’ll add it to the list. Often, The Smiths say that they’re swamped with requests for one sort of tea––the craze of the day, so to speak.